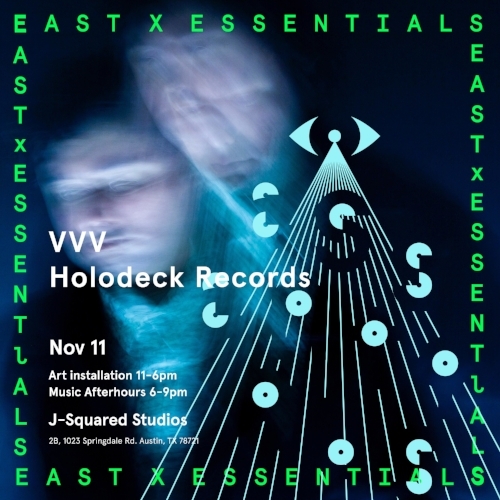 On Sunday, November 11, 2018, Holodeck's dear friends and collaborators Essentials Creative have a new show for East Austin Studio Tour 2018 from 11am to 6pm at J-Squared Studios. Essentials are true innovators in an array of fields such as fashion, film, photography, graphic design and visual art, with a unique and contemporary aesthetic all their own. To help celebrate their installation for EAST 2018, we are planning an after-party from 6 to 9pm featuring sets from Holodeck electronic artists VVV and Dylan Cameron from inside the installation itself. This is going to be a one of a kind audio/visual event featuring some perks and amenities for attendees only. Click HERE to see full details on the Facebook event page.